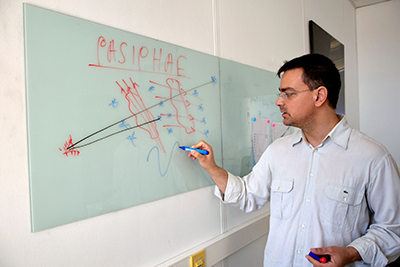 Konstantinos Tassis, Assistant Professor of the Department of Physics of the University of Crete and Associate Faculty Member of the Institute of Electronic Structure and Laser (IESL) of the Foundation for Research and Technology - Hellas (FORTH), was awarded a “Consolidator Grant” by the European Research Council (ERC) to implement the PASIPHAE experiment (http://pasiphae.science/). The PASIPHAE project, whose funding amounts to € 1.9 million, will have a duration of five years and will be executed at IESL-FORTH within the Astrophysics Group, which constitutes a joint activity between IESL-FORTH and the Department of Physics of the University of Crete. The program of Consolidator Grants aims at supporting scientists to consolidate their independence by establishing a research team and continuing to develop a successful career in Europe. IESL is proud to underline that this is the sixth time that an IESL researcher receives a prestigious ERC grant. The PASIPHAE (Polar-Areas Stellar-Imaging in Polarization High-Accuracy Experiment) experiment will be carried out by an international team, coordinated by Prof. Tassis, and will map, with unprecedented accuracy, the polarization of millions of stars at areas of the sky away from the Galactic plane, in both the Northern and the Southern hemispheres. The observations will be made with special instruments of innovative technologyat the Skinakas Observatory, Crete, and the South African Astronomical Observatory in Sutherland, South Africa. Based on these new measurements, a three-dimensional map of the magnetic field of our Galaxy will be created, for the first time. Thus, it will be possible to identifythe best regions of the sky where astronomers can lookfor the imprint in the primordial light of the first moments of the creation of the Universe. The ERC Referees of Prof. Tassis' proposal write (in their anonymous evaluations) that the success of this project will have a “major impact on cosmology as well as on Galactic astrophysics”. They note that the project “could deliver a unique contribution, and possibly decisive”in the search for primordial light. They conclude that the proposal is “revolutionary” and “will go so far beyond the current state of the art” constituting “a major leap”in the respective scientific field. This project will take advantage of complementary funding by the Stavros Niarchos Foundation, the Infosys Foundation of India, the South African National Equipment Program and the National Science Foundation of the United States of America as well. Konstantinos Tassis obtained his B.Sc. in Physics from the University of Thessaloniki in 1999 and his PhD in Theoretical Astrophysics from the University of Illinois at Urbana-Champaign, USA, in 2005. He was a Postdoctoral Fellow at The University of Chicago (2005 - 2008) and at the Jet Propulsion Laboratory, a NASA lab run by Caltech, (2008-2011). He was elected an Assistant Professor at the University of Crete in 2011, and he joined the Department of Physics in the fall of 2012. Between 2011 and 2012 he was a Visiting Scientist at the Max-Planck Institute for Radioastronomy in Bonn, Germany. His research interests are on star formation in the Galaxy and the Universe, interstellar medium physics, MHD simulations of astrophysical systems, interstellar chemistry.